How to Play Video Poker in the 21st Century | Its all online baby! How to Play Video Poker in the 21st Century | Its all online baby! Video poker machines were introduced in the 1970s. They were the first computerized casino game that offered a skill aspect, and even today they represent one of the best plays you can find both live and online. If you love the game of poker but can do without all the head games, then online video poker is a fair alternative to the live tables. Plus, in online video poker everything is automated, making it possible to play hundreds of hands an hour. Though new video poker variations are being designed every day, almost all of the titles you will find online are based on the original five card draw format. Five card draw is arguably the easiest poker variant to learn and play. If you didn’t learn how to play poker via a college Texas Hold’em game, then chances are you learned it via a family five card draw game. Nostalgia aside, traditionalists love online video poker for its straightforward strategy. It is easy to learn how to play video poker games online because players only have a couple options per hand. Once you’ve used the “Bet” or “Bet Max” buttons to make your wager, you’ll hit the “Deal/Draw” button to start each hand. Five cards will appear at the center of the screen. You will either click on each card or a button beneath them to select which you want to hold and which you want to discard. Clicking Deal/Draw again will replace your discards with new cards to reveal your final hand. It is important to note that while virtually all of the video poker games you will encounter online are based on the five card draw format, there is a wide array of variations on that format. 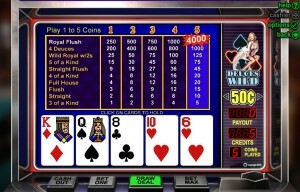 The original – and still most popular – video poker game is Jacks or Better. As the name implies, the lowest eligible paying hand on these games is a pair of Jacks or better. The introduction of wild cards led to titles like Joker Wild and Deuces Wild, and the introduction of increased pays for specific combinations led to Bonus Poker, Double Bonus Poker and Double Double Bonus Poker. Some video poker games also give you the option of doubling each win with a high/low side game, and others add excitement and value with progressive jackpots.